The Charlevoix area was part of what was called Michilimackinac formed in the Treaty of Washington in 1836. French explorer Pierre François Xavier de Charlevoix is said to have stayed on nearby Fisherman Island and the area was named after him in 1836. Several University of Chicago professors visited Charlevoix after the Civil War and formed a summer association--an enclave of homes and summer activities--named the Chicago Club. Two more summer associations were later formed: The Belvedere Club and the Sequanota Club. Exclusive hotels, the Inn and the Beach, were the summer destination for people from around the Midwest. Two depots served summer guests, one at Belvedere and the Pere Marquette Railway depot. Guests also arrived in the late 1800s on steamships including the Manitou, Alabama, North American, South American, Milwaukee Clipper, and Illinois. During the Prohibition, Chicago area gang members moved their operations to Charlevoix. The Colonial Club became a gambling joint for some of the Midwest's most powerful. A barge-turned-speakeasy traveled from Charlevoix to Boyne City carrying passengers in style during the summer months. 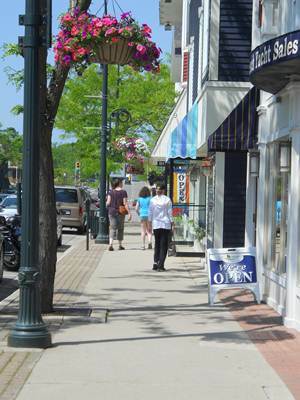 In later years, Charlevoix became known for events that happened nearby such as the sinking of the freighter the Carl Bradley in 1858 and the crash of an unarmed B-52 aircraft in 1971, both just off shore. Charlevoix is the home of the nation's first nuclear plant, Big Rock, which operated from 1962-1971. Visitors come from around the world to see architect Earl Young's 27 distinctive mushroom houses that still remain and have been restored. Charlevoix's history can be revisited at the Harsha House Museum and Charlevoix Depot Museum.